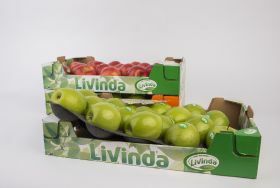 Premium apple brand Livinda has taken the first steps to remove single-use plastics by replacing polypropylene trays with ones made from cellulose derived from recycled paper and cardboard on its 50, 30 and 9.5 count cartons of Livinda Pure Premium and Livinda-branded apples. The move will lead to a reduction of almost 14 tonnes of plastic a year. “We are fully aware of the serious problem that single-use plastics create for the entire planet, contaminating our natural resources which, if we are not careful, will cease to be productive in the coming years,” said Ignasi Argiles, director production and marketing of the Nufri Group, which manages the brand in Spain. The company’s focus on sustainable production also includes a commitment to renewable energies including solar, biomass and hydraulics.